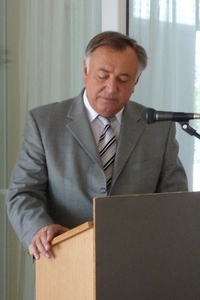 The Ukrainian Ambassador in Greece, Mr. Valerii Tsybukh, took part in the function programmed by the Municipality of Aegina for Ioannis Capodistrias. 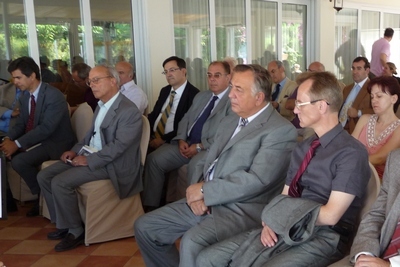 On Saturday 20th June 2009 the General Meeting of the members of the Capodistrian Cities Network was held on the premises of the Capodistrian Kyverneio of Aegina (Historical Archive). Participants in the network are the Greek cities of Aegina, Corfu, Nafplio, Famagusta in Cyprus and Koper-Capodistria in Slovenia. The General Meeting was inaugurated with a performance by the ANIMA string quartet. Subjects discussed during the meeting included further expansion of the network following assumption of the presidency by Aegina, the entry of new members, participation in activities and actions such as the European Programmes. The second part of the function also had a musical introduction in the auditorium of the Hotel Danae, again with the ANIMA quartet, followed by speeches of welcome from the mayor of Aegina Panagiotis Koukoulis and addresses by Georgios Tsatiris, President of the Aegina Council, on the subject of the Capodistrias Cities’ Network, by Andreas Koukos, historical researcher, on the subject of the Congress of Aix-la-Chapelle (1818) – “The European vision of Capodistrias”, by Nikolaos Kourkoumelos, Doctor of Contemporary History, on “From Secretary of the Septinsular Republic to the Congress of Vienna”, by Vassia Tsokopoulou, Historian, on the subject of “The General Interest of Europe – Ioannis Capodistrias as Mediator”, by Alexis Krauss on the subject of “Citizens’ Europe”, by Panos Trigazis, economist, on the subject of “Capodistrias-Spinelli, the stages of European Integration” and Ioannis Coccalas Deputy Director of Athens Office of the European Parliament on “From Altiero Spinelli’s Draft Treaty to the Treaty of Lisbon”. See a videoed extract here.